Massachusetts’ Ameresco Inc., an energy efficiency and renewable energy company, today announced the landfill gas to renewable natural gas facility at Waste Management’s Woodland Meadows Landfill in Wayne has achieved EPA approval and is now in operation. Ameresco designed, built, owns, and operates the biogas-to- renewable natural gas facility that was commissioned in November 2017. The facility operates continuously. Blower stations draw the gas from the raw landfill gas to produce pipeline-quality gas for distribution in the local gas distribution system. It is then injected into the natural gas pipeline, where it can eventually be used in the vehicle fuel market. GAIN Clean Fuel has partnered with Ameresco and takes ownership of the renewable natural gas (RNG) distribution system and transports it for use within the transportation sector. 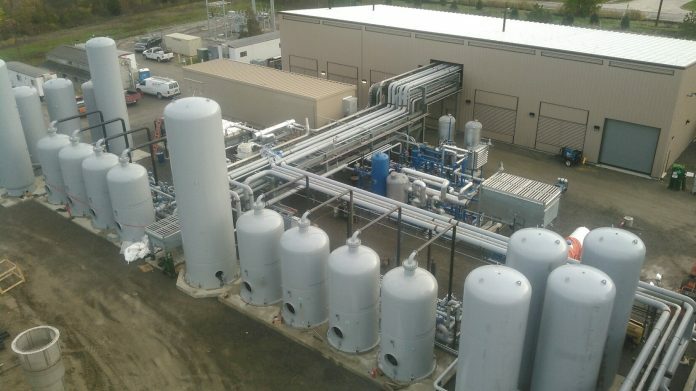 Traditionally, landfill gas is flared onsite, but current technologies allow for the harnessing of this gas and its conversion into a cleaner renewable transportation fuel. Waste Management is a Texas-based provider of waste management environmental services in North America. U.S. Gain is a supplier of renewable and compressed natural gas.